The Philippines is home to many of the world's major religious congregations, and today these include the Augustinians, Recollects, Jesuits, Dominicans, Benedictines, Franciscans, Carmelites, Divine Word Missionaries, De La Salle Christian Brothers, Salesians of Don Bosco, and the indigenous RVM Sisters. 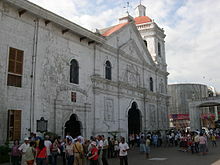 ^ "History of Cebu | Philippines Cebu Island History | Cebu City Tour". Retrieved 2019-03-18. ^ "Spanish Fortifications". filipinokastila.tripod.com. Retrieved 2019-03-22. ^ Neuman, Scott (20 August 2017). "Church Leaders In Philippines Condemn Bloody War On Drugs". National Public Radio. United States. Retrieved 15 August 2018. ^ Regencia, Ted (13 June 2018). "Philippine Catholic priests: 'They are killing us'". Al Jazeera. Qatar. Retrieved 15 August 2018. ^ Watts, Jake Maxwell; Aznar, Jes (5 July 2018). "Catholic Church Opens Sanctuaries to the Hunted in Philippines Drug War". Wall Street Journal. United States. Retrieved 15 August 2018. ^ Phillips, Kristine (19 July 2018). "Duterte's drug war killed thousands, and Filipinos still loved him. Then he called God 'stupid.'". Washington Post. United States. Retrieved 15 August 2018. ^ builder. "home". Feast Family. Retrieved 2019-03-21. ^ "Soldiers Of Christ Catholic Charismatic Healing Ministry Official". www.facebook.com. Retrieved 2019-03-22. ^ AsiaNews.it. "The Philippines, 1995: Pope dreams of". www.asianews.it. Retrieved 2019-03-20. ^ Service, New York Times News. "Millions flock to papal Mass in Manila Gathering is called the largest the pope has seen at a service". baltimoresun.com. Retrieved 2019-03-20. ^ "Pope Francis invited to Cebu event in 2016 - Tagle". philstar.com. Retrieved 2019-03-22. ^ ABS-CBNnews.com, By Jon Carlos Rodriguez. "'Luneta Mass is largest Papal event in history'". ABS-CBN News. Retrieved 2019-03-22. ^ "Briefly In Religion". latimes.com. Retrieved 2019-03-22. ^ "cardinal vidal says dialogue helped limit bloodshed during coup". ucanews.com. Retrieved 2019-03-22.